Last July, I sketched out what I knew of George's siblings, in this post. Since then I've uncovered more information about some of them, and although it doesn't shed any light on George himself, I find it all interesting, so I'm writing it down. I had thought that George's sister Mary Ann never married, but I was wrong. I recently discovered that in 1894, about six months after her eldest sister Elizabeth died, Mary Ann married Elizabeth's widowed husband, James Taylor. Because the gap between Elizabeth's death and James' remarriage is relatively small, the devil in me has to wonder if James and Mary Ann had struck up a relationship before Elizabeth died. Did they, indeed, have something to do with her demise....? Naw, I've been watching too many cop shows. Mary Ann was 47 years old at the time of the marriage, and James was 60, so not surprisingly, they had no children. They lived in Fremington, Devon, not far from other Cockram family members, where James was a market gardener, working for himself and employing at least one other person. I can find them there until 1911, when she was 64 and he was 77 and retired. I still haven't found a death record for either of them. Not too long ago I happened to stumble upon the burial record for John Cockram's wife, Grace Adams, just because it was on the same page as that of Elizabeth Cockram Taylor, mentioned above. Grace was buried at Fremington, where she grew up, although she hadn't lived there for some time. Her residence at the time of her death in December 1893 was recorded as 'County Asylum, Exminster'. Well naturally, that sparked my interest. 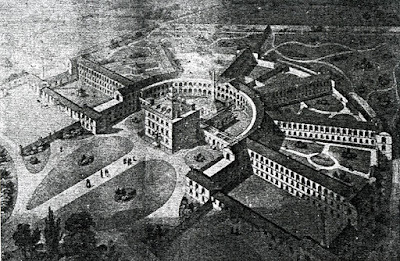 I went looking for information about the asylum, and learned that it was an ultra modern 'lunatic asylum' when it opened in 1845, and had many amenities, including a ballroom. In its early years it developed a wonderful reputation, but by the time Grace was admitted, it had plunged into serious overcrowding and staff shortages, depriving patients of individual attention. The asylum's patient records are kept in the Devon Archives in Exeter, but are not online. So I went looking for someone who could go to the Archives on my behalf, and I found Rosaleigh via http://www.familytreeforum.com. She lives in Exeter, and was happy to do some research for me. Rosaleigh discovered that Grace was admitted to the asylum in October 1893, was described as 'manic' on admission and had been ill for more than a month before that. She soon deteriorated into incoherence and incontinence, and developed bedsores, an abscess on her jaw and a high fever. She lapsed into a coma, and died less than two months after she arrived. The asylum apparently attributed her problems to 'Change of Life', which was the overall heading of her notes. She was 44 years old, and menopausal when she died. Rosaleigh looked at records of several other women around the same age, and found that menopause was commonly recorded as the cause of whatever problems they had. Who knows how long she had been suffering, or what her husband John went through at that time. They had been living in Wales up until at least two years before Grace died - did they come back to England in hopes of finding some expert help for her? That didn't work out very well. What did George Sound Like?